The advantage camouflage DVO-1 Organizer Case from Porta Brace is designed to hold compact Mini DV camcorders and accessories. It is made from 1000 denier Cordura fabric with a new, slip-resistant, easy-clean rubber bottom. It fits popular mini-DV cameras with add-on items such as wireless mics, etc. It has a universal cradle, a camera tie-down strap and a soft stuff pouch to keep the camcorder stable. A plush, 1.0" thick foam pad adds extra stability and protection. This case is made in Vermont, USA. Box Dimensions (LxWxH) 10.0 x 8.6 x 7.5"
DVO-1 DV Organizer Case (Advantage Camouflage) is rated 4.4 out of 5 by 14. Rated 5 out of 5 by David the Producer from High quality bag as always I use this to carry my Sony Z7U, it fights like a glove which unfortunately means if you're using this camera there is very little room inside the bag for things such as lavaliere. Plenty of room for my hot shoe camera light, a few extra batteries, tapes, etc. but nothing really larger than the palm of your hand. The bag is very sturdy, has comfortable large straps and handles, plenty of compartments for more small items. The non-skid material on the bottom of the bag is a nice addition; the bag will not slip on any solid flat surface. It even came with a mini goose neck LED light. This is my second PortaBrace product and I will continue to purchase them. Rated 5 out of 5 by Jack Of Many Trades from Great Video Camera Bag I just got the Canon XA-20. You can place this camera in the included cradle with the microphone attachment and the clearance is fine. I thought the bag a big large, but then again if you are carrying an external monitor say 5 screen, shock mount if needed, cables it all works. I considered the larger bag which does not cost much more maybe $ but I did not want to go too overboard. If you need to scale down the XA-20 kit this bag is too big.I think important to use the included cradle or something to keep the camera from moving freely. Of course if you have a larger camera than the XA-20 say 6 longer it will take the rest of the length of the bag as a estimate. Rated 1 out of 5 by lgcamman from Does not fit NX5U well. I love portabrace cases. If this case fit my camera, it would be a 5 star review hands down. I gave it one star to alert readers that even though porta brace and B&H advertise this case will fit a NX5U, it does with no room left. I have to take the external shotgun mic off ever time I put the camera in the bag. Because of the size issues, if your camera is the size of a NX5U or Z5U, get the DVO-2 (which I did). Much more room for things like headphones and lights. All and all, the DVO-1 is a great bag if your camera will fit nicely in it. Great protection with the pillow and strap to keep your camera secure. It will also fit in overhead compartments well. Rated 4 out of 5 by Doc Man from Good Case I bought this case because the DVO-2U was a good bit bigger--and while also being a great case, it did not fit into an overhead compartment bin on an airplane. So I needed this case to travel around and stow on plane trips. It's a simple, small case, with not a lot to it, but what you would expect from a Porta Brace. Rated 5 out of 5 by Ira from Porta Brace DVO-1 Case FAA Accepted This is the biggest case you'll be able to bring with you on board both domestically, as well as internationally. 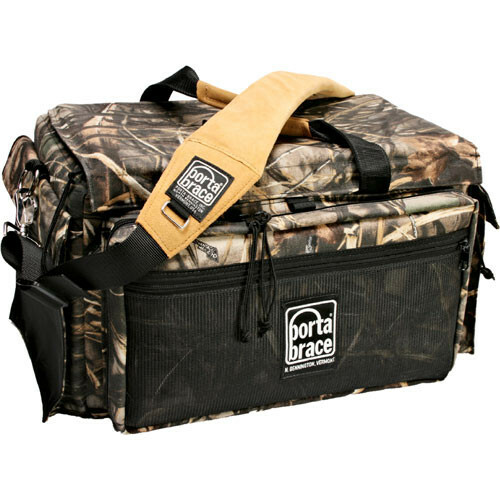 I've been using Porta Brace cases my entire professional career. They are still made in this country and are of superb craftsmanship. If you want to carry delicate gear with you and don't want to have a hassle due to size restrictions with the airlines, trust that Porta Brace has done their homework! Rated 5 out of 5 by Anonymous from Awesome product. I thought this case would fall between a traditional hard case and a soft case for protection but the sides and top are so solid it feels like it protects like a hard case. So it's like a hard case with all the advantages of a soft case, less bulk, lighter and easier to work with. This is a great product. Rated 5 out of 5 by parkwood from compact and aesthetic case Bought this case for the Canon XH-A1. Also checked out other alternatives before settling for this organizer. Though I missed the rain protector slick (optional acc.) the case size, it's neat design and sturdiness, the compartments for accessories and the material quality receive 5 stars.